The TDA2040 is a monolithic integrated circuit in Pentawatt package, intended for use as an audio class AB amplifier. Typically it provides 22W output power (d = 0.5%) at Vs = 32V/4Ω . The TDA2040 provides high output current and has very low harmonic and cross-over distortion. 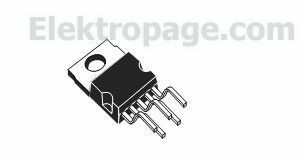 Further the device incorporates a patented short circuit protection system comprising an arrangement for automatically limiting the dissipated power so as to keep the working point of the output transistors within their safe operating area. A thermal shut-down system is also included.